Table in Lecce's stone with built-in glass. Its entirely handmade without the use of machineries but only with hammer and various types of chisels, rasps and sandpaper. The table Ulivi born from the study of the Salento territory and in particular of the ancient olive trees that with their shapes hypnotize those who observe them. The work is entirely handmade in Lecce's stone. This makes each piece unique and original. 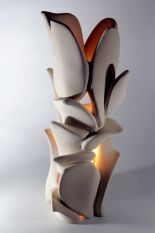 The object, which is derived from the precise work of a single block of stone, decorate the environments with a warm glow. Reproducible never the same, because result of craftsmanship, in 20 days, even in larger sizes on request. The price varies according to the sizes required.